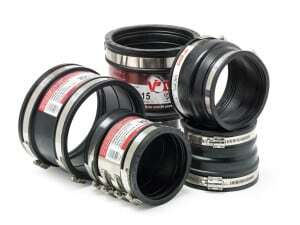 VIPSeal® is our range of versatile rubber UK Manufactured flexible couplings and adaptors. Wholly manufactured in house and designed for joining and repairing pipes in sewerage, drainage and other non-pressure pipe applications. We have over 20 years experience of manufacturing these couplings which meet all relevant UK water industry standards. Because we are the manufacturer of the finished coupling, we are able to deliver significant cost benefits to our customers by removing additional stages in the supply chain. Our VIPSeal® range of flexible couplings and adaptors are fully approved to the very latest UK, EU and worldwide drainage application certifications. For further information, please visit the VIPSeal® website.